Mail from India is being received here every fifteen days. Letters from India, four bundles of the Review of Religions (English) and Al Fazl of 5-7 October was delivered on 30 November. The letters were written between 25 September and 8 October. Hopefully, within a few months, mail will be delivered weekly, Insha-Allah. After the announcement of victory (in the first world war), King George V and Queen Mary paid visits around London. Countless people gathered in streets, market places and parks, congratulating the King and Queen with hoorays and cheers. As the city is fairly big, the tour was extended to several days. There came a day when the tour reached the place of our residence and by chance, I came to know that the royal entourage was going to pass by Star Street. The street was filled with crowds of men and women. I too stepped out with a small flag in my hand and stood outside my house by the street. I waved the flag as the royal car, which was rather small in height, moved steadily passed me and I greeted members of the entourage with Salam. The Queen and Princess Mary were sitting on the side closest to where I stood. Both of them responded to my Salam with a delight on their faces and kept looking at me till the car passed by. The same evening, I wrote a letter to the Queen, congratulating her on the victory and expressing gratitude for accepting my Salam whilst passing by Star Street. Furthermore, after explaining that the Nabiyullah [Prophet of God] Ahmadas had prophesied the war and prayed for Britain’s victory many years ago, a photograph of the Promised Messiahas was sent to the Queen and another one for the exalted King. This photograph was probably taken in 1903 in which this humble one is seated at the feet of the Promised Messiahas. 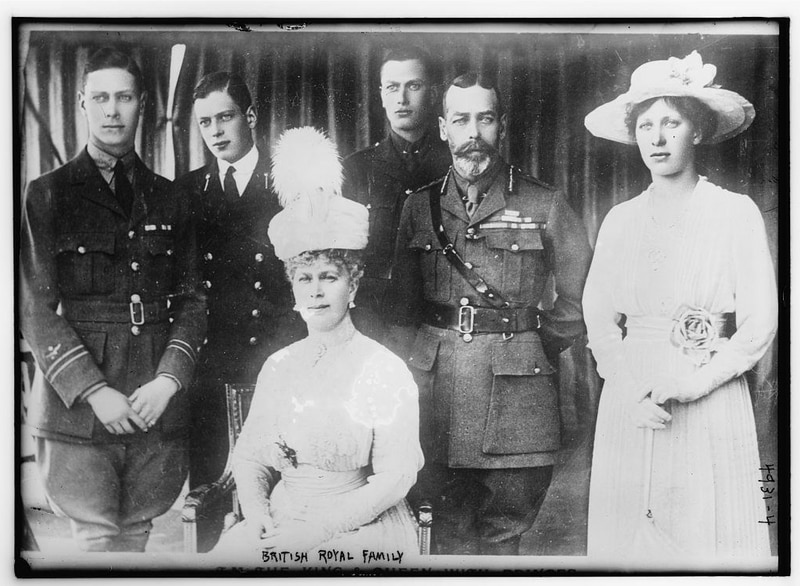 It was a moment of great pleasure that the exalted Queen accepted the two photographs and her private secretary informed me about it in a letter dated 19 November 1918. A copy of this royal letter has been sent to be presented before Hazrat Khalifatul Masih. Similarly, a letter expressing congratulations regarding the establishment of peace and the prophecy about the war was sent to the prime minister of the British Empire. A reply of acknowledgement and thanks was received on 18 November. A copy of this letter has been sent to Hazrat Khalifatul Masih. As referred to by The Times, on 6 November 1918, the priest at Zion College, Dean Eli (the priest of the college is called Dean), whilst delivering a speech there stated that some chapters in the Bible ought not to be read out in public until and unless some words were omitted or edited from them. The priest was generally referring to the verses of Psalms, chapters 69, 109 and 137. The priest desires to eliminate these words of Psalms from the Bible. However, in the days of war, particularly the war in which both the parties were Christian, is it not true that both sides wanted this kind of destruction for the opposing side as is the purpose of these prayers? Thus, if our enemy deserves to be destroyed like this owing to a worldly dispute, how can it be inappropriate to pray like this for the one who discomforts a prophet of God without any reason? Nevertheless, it is more than likely that mistakes occurred in the translation, and the actual phrases of Psalms were altered as the Bible has gone through a series of changes due to which it is not in its actual form, a fact that is acknowledged by Christian scholars as well. I happened to come across an Arab scholar here who belongs to Yemen. I presented him several Arabic books of the Promised Messiahas to read and continued preaching over a period of time. At last, with the blessings of Allah the Almighty, he accepted the true faith. His name is Abdul Rahim bin Qasim. May Allah grant him steadfastness and bring others on the right path through him. Amin. London roads are fairly wide. There are separate pathways for cars and pedestrians. Traffic flows smoothly on both sides of roads with dividers in the middle separating the two sides. There are alert policemen where the two roads cross each other. They make sure that vehicles do not crash into each other. “I humbly state that I, being a representative of Jamaat-e-Ahmadiyya (great numbers of which actively participated in the war) in this city, congratulate His Majesty and the Belgian nation from the depths of my heart on the favourable outcome of this war which was established for the allied forces. Hazrat Nabiyullah Ahmadas, resident of Qadian, India had prophesied about the war in 1905 and prayed for Britain’s victory, which was, in fact, in favour of the allied forces. He was God’s chosen one. His prayers were fulfilled in the court of the Omnipotent God and this establishment of peace has presented another sign of his truth. “I humbly present a book, Tohfat-ul-Mulook (A Gift for the Kings) which was written by Hazrat Mahmud, the present leader of the Ahmadiyya Jamaat. I am grateful to Allah the Almighty that He bestowed upon me the opportunity to spread the news of the Promised Messiah’s advent along with the book Tohfat-ul-Mulook to the above mentioned 18 rulers. A letter of acknowledgment has been received from […], the ambassador of Serbia’s King in London. He writes that they are certain that King Peter would take this letter and the book Tohfat-ul-Malook with great consideration. Praise be to Allah the Almighty! I request the respected members of the Jamaat to pray that Allah the Almighty covers our weaknesses through His attributes of kindness, mercy, blessings, compassion, sattari (coverer of flaws) and forgiveness. May our sins be forgiven. May our mistakes be pardoned. May we fulfill our goals and all our aims be for the pure pleasure of God. May Allah the Almighty grant us a devoted, truthful and reformatory group of people. May we become the leaders of righteous. May our flaws and errors be forgiven.